You just bought a perfect pair of fake eyelashes and as you go to place them upon your natural lash line, you notice that they are way too long. This becomes bothersome for you, and you know that wearing them in this state will only create discomfort and cause the final appearance to look a bit strange. Once you’ve found the perfect set of false eyelashes to match your own unique eye shape, cutting them down to size becomes the next step. Trimming false eyelashes is sometimes a necessary part of the process when you receive a new pair of falsies, especially if you are an individual with a smaller eye size. The majority of the time, eyelash producers will create longer sized falsies, specifically so that they can be more suited for most individuals. If you determine that you’ve received a pair of overly long fake eyelashes, aside from wondering how much length you should cut off, you may also hold a different question; how exactly should one go about cutting off the extra length? If you want to trim false lashes, the process is simple. 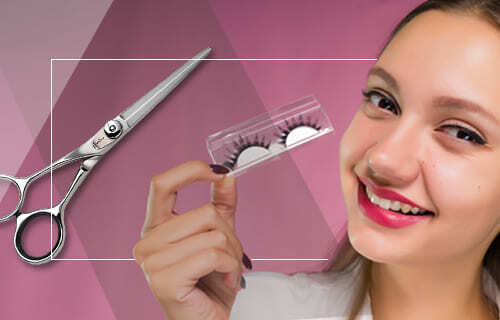 Whether you want your falsies looking natural or fake, all it takes to give them a trim is reaching for the scissors and following up with a few safety issues and ramifications. In this article, we will take you through the process of trimming your false eyelashes, so that you never have to wonder again and can always keep your new falsies looking fabulous! If you’ve found that your falsies are too wide for your eyes, you’ll need to cut your falsies to fit. Trimming false lashes can be done in 2 simple steps, but it does sometimes require a bit of patience and practice, especially the initial few times. Once you’ve learned what steps to take, the procedure should be simple and easy. The result will be perfectly sized lashes that are stunning, beautiful, fluttery and match your eye size elegantly. If you are ready to achieve tailored-to-you sized falsies, keep reading on and we’ll explain what you need to do. In order to cut your fake lashes, you’ll need a few rather self-explanatory items. A clean pair of eyelashes, preferably unused for sanitary reasons! Picking up your false eyelashes, measure your eye using the clean, unused false eyelash by placing it upon your eyelid with a pair of tweezers. If you don’t happen to have any tweezers on hand, your finger can do the trick as well, and some people even prefer to handle their falsies in this manner. In order to make sure the lash is the correct length for your eye size, place the fake eyelash exactly where your natural eyelashes begin at the inner corner of your eye, and allow the excess length to hang over the outer corner of your eye. At the spot where your natural lashes end, or just a little bit over, is usually the right place to trim your falsies for the proper fit. You never ever want to trim the inner corners of your lashes, so make sure first of all that you have the correct set of the pair on the correct eye (sometimes it can be easy to mix up the left and right lashes with certain falsies), and always be sure to only take away length from the outer edges of the lashes. Using your tweezers, pinch the strip on the outer side at the location where you’ll be trimming the false lashes. Sometimes, one eye can be a bit bigger than the other, so it is best to measure each of your eyes separately. The more that you measure your false eyelashes and trim them down, the easier the process will become, greatly speeding up the time it takes for you to get that ideal fit from your falsies. And remember, the old saying still rings true; practice makes perfect. Once you’ve placed a marker on your eyelashes, using a small, sharp pair of scissors trim the lash where you made a mark with the tweezers. Do the same for the second lash in the pair, and remember that the two lashes might be slightly different sizes, which is totally natural and alright. There are a few things to always remember when you trim the false lashes you’re working with. It is important to consider these tips so that you don’t end up ruining a set of your favorite lashes. If you are concerned about the outcome, try testing out the process on a cheaper or less expensive pair of falsies. Some companies selling inexpensive sets includes Kiss, Eylure, Ardell, Davocy, Miss Kiss, and J.Cat Beauty. As we mentioned earlier, always cut from the outside edge only. The inner edges will always remain the same. They’re designed with smaller hairs and a different form usually, which is what helps them blend better with your natural lash line. The outer lashes, on the other hand, are more uniform to one another, and this is done purposefully because lash companies know that many of their wearers are having to trim down their newly purchased set, and they want to tailor their products to as many of their customers as possible. Be conservative with your cuts. It is best to start out small; just cut little by little until you achieve your desired length. You really don’t want to over-trim the lashes, because once this is done, it becomes difficult to add the length you removed back to the strip. After you are done with the trim, be sure to test the fit of the lashes to see if you need to remove any extra hairs for them to become even more comfortable. By laying them across the tops of your existing lashes and comparing the fake eyelashes to the length of your natural lash line, you can determine if your falsies are the right size. Be sure to make a small cut to fit your lashes to your natural lash line. By cutting precisely with a sharp pair of scissors, you can avoid any extra snagging that can affect the quality and appearance of your fake eyelashes. Also make sure to cut only in between hair clusters, because you don’t want to damage any of the lash hairs that you intend to keep on the strip. Once you’ve followed these two simple steps and considered all the tips we’ve mentioned, it should help make putting your lashes on easier. Sometimes it can take a bit of time to get used to trimming your false eyelashes and getting them to a place where they are the right size for you. Nevertheless, this part of the process is essential, otherwise, you will end up with a set of fake lashes that is incredibly uncomfortable and challenging to wear for long periods of time, which nobody wants when they are attempting to look and feel their best while flaunting a beautiful set of false lashes. For this reason, try to practice trimming your falsies down as often as possible. Many brands offer lashes that can be worn 20-25 times, which makes the number of times you’ll need to trim down your lashes fewer in number, especially if you fall in love with a specific style and enjoy wearing a select pair again and again. Some brands we love that sell high-quality falsies that also have longer durability includes Esqido, Velour, Eylure, Huda Beauty, Lilly Lashes, and House of Lashes. We hope that this two-step guide has been of benefit to you and your false eyelashes journey. Just remember, make simple adjustments to your lashes first, trimming a little more as needed. Keeping this in mind will help make your eyelash trimming process a breeze.